My Birch Box is here and with it brings some of my favorite things! 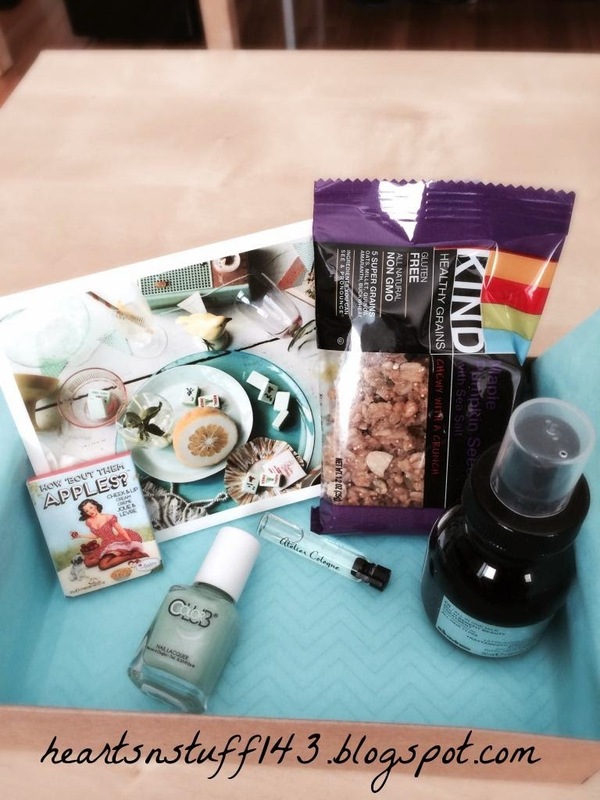 A mint shade polish, a leave in conditioner that works as a de-tangler, and Kind Snacks! YAY! theBalm Cosmetics, How About them Apples- This works as a blush and lip stain. Simply put on apples of cheek and rub in to make as light or dark as you desire! Also great and stays on lips for period of time! Color Club, Nail Polish- It's a mint green color- obvi my favorite color for Spring! I am a strong believer in Essie polish but I think with a top coat this will do the trick! Atelier Cologne, Cedrat Enivrant Cologne Absolue- Has a citrus scent that is very fruity. Seems like it would last throught out the day! Kind, Granola- Love Kind bars so this was the perfect little snack for on the go like I usually am! Davines, Oi All in One Milk- Leave in spray gives volume, shine and detangles while protecting from the heat! This is just what I was looking for and am so happy to try it out!